For those that do not know, Influenster is a company where you complete badges. 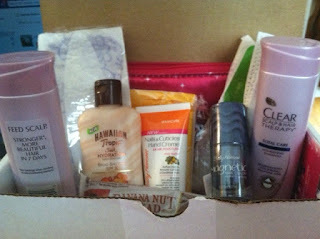 They send out "boxes" to members periodically throughout the year, and I was chosen to receive the summer vox box!! Clear Scalp and Hair Therapy Shampoo, 3 oz. Clear Scalp and Hair Therapy Conditioner, 3oz. Hawaiian Tropic Silk Hydration Sunscreen, 2 oz. Sally Hansen Nails and Cuticles Hand Creme, 1 oz. The best part is, everything was FREE!!! Congrats on getting your box. Oh my gosh! Can't wait for mine to come in the mail . This is my first one and it seems like a good one! It is my first as well and I loved everything!